Commerical EPCs London Kent Essex. All commercial properties require an Energy Performance Certificate when being sold or let. Ratings are often used by tenants or potential buyers to make energy comparisons between properties. A Commercial EPC comes with a recommendation report that outlines how the energy performance of the building could be improved. Benefits of a Commercial EPC? An EPC assesses a buildings by giving a standard energy and carbon emission efficiency grade from ‘A’ to ‘G’, where‘A’ is the best and with the average to date being D/E. Property with the best ratings are more attractive to potential tenants and buyers as they are cheaper to run. Not having a valid Commercial EPC can be a real inconvenience for both owners and property agents. There is now shared responsibility between agent and commercial landlord to make sure that the property is legal to market by having a valid EPC within 7 days of marketing, if one is not already available, a reduction in time from the original 28 day grace period that was in place before April 2012 legislation came into effect this year with more stringent criteria regarding EPC law. What Are The Consequences Of Not Having a Commercial EPC? 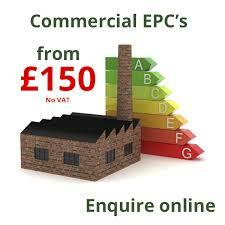 To Book a commercial EPC, simply fill out the form and we will contact you as soon as possible. Alternatively call on 07736 311077 and we will be able to run through the details of the property you wish to book an EPC appointment at. A property can be legal to market as soon as an EPC is booked so there is no need to worry about having to wait for the assessment to be completed and the certificate in your hands. Who Will Carry Out The Commercial EPC? A Commercial EPC assessment will be carried out by a certified Non-Domestic Energy Assessor (NDEA), who is qualified to the Level in which the property falls. As well as being qualified each assessor must be accredited by one of the government approved bodies, where they are regularly audited to ensure they are in compliance with the high standards set. ALL EPCs ARE CARRIED OUT BY MYSELF – A FULLY QUALIFIED AND ACCREDITED ENERGY ASSESSOR. NO MIDDLE MAN TO TAKE A 30% CUT !! !